Nyx was the goddess of night. Her name, synonymous with Night, describes how her dark light falls from the stars, and she dictates to men and also to the gods. Not even Zeus wanted to upset Nyx, as the stories go. She was one of the most powerful goddesses to be talked about in Greek mythology. Three native New Orleans women always loved the traditions, pagentry, and fun of Mardi Gras. For years they admired the floats and loved the bands. They enjoyed how much the kids' faces would light up when they caught stuffed or beaded treasures. The women adored how the crowds screamed to the riders "Throw me something!" It's a tradition in Mardi Gras that the names of the Krewes are usually after Gods or Goddesses in Greek or Roman mythology. Nyx was the Greek Goddess of night. The three knew they wanted to parade at night and be the goddesses of the streets of New Orleans during their ride. 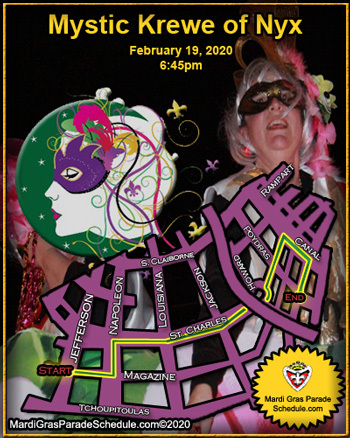 Bringing together women of diverse backgrounds and enhancing the spirit of Mardi Gras for the community is the vision for the Krewe. Embracing a little bit of tradition, with a twist of new and fun ideas, is what makes the Krewe of Nyx so special. All women are goddesses no matter what age they are. Every woman deserves to be adored, respected, and made to feel beautiful. Show off your inner goddess while having the time of your life.